About a month ago HEXUS reported upon information and imagery leaks which were purported to show a new disc-less console from Microsoft called the Xbox One S All Digital. Now another source has chipped in with what it claims are further actual product shots, hardware details, pricing and launch dates. WinFuture.de images look very much like the renders we saw last month; however its packaging shots include full descriptive text rather than placeholder type and text boxes. 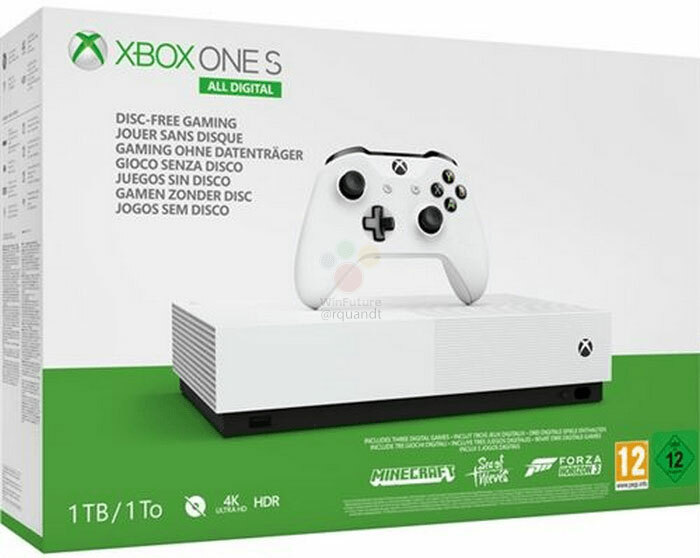 On the front of the box image shared you can see the name of the console confirmed as 'Xbox One S All Digital'. Then you see the phrase 'Disc-Free Gaming' in various European languages. On the bottom border of the box we see that this is a 1TB model which can still play 4K and HDR entertainment but another icon reminds the buyer that there is no disc playing on this console. This packaging is for an Xbox One S All Digital bundled with Minecraft, Sea of Thieves, and Forza Horizon 3. More games can be purchased via the Microsoft Store. Furthermore, a Game Pass "gives users access to an ever-expanding library of over 100 games that can be freely downloaded thanks to a paid monthly subscription, as on the other Xbox models," notes WinFuture. A single controller is in the pack. According to the source, Microsoft will launch the Xbox One S All Digital tomorrow, at a special event. It is expected that pre-orders will be opened up shortly after the launch with availability starting from 7th May in Europe. On the topic of pricing, optimistic projections appear to have been dashed. WinFuture quotes an MSP of €229.99 in Europe which equates to £199.99 in the UK. I've had a quick look around at current Xbox One S console pricing in the UK and notice that the 1TB console with one controller costs £179, and multiple game bundles are available around the £200 mark. Hence, the launch price for the disc-less version doesn't look very persuasive for consumers. Those mockups will be way out. The bluray drive in the current S is huge, add to that they can move the chip onto a smaller/cooler process, use a smaller PSU etc, it'll be half the size of that. What a stupid name. You mean it wasn't digital before? And I hate to be that prick but if it has an analogue audio out on the back, it's not all digital now is it? Now that's out of the way, the price is stupid, too. It needs to be roughly the value of a half decent blu ray player cheaper to convince customers. But what they're obviously doing is reducing the value of the product with a view to removing availability of the optical drive version whilst keeping the price near enough the same. Because Microsoft have forgotten what happened last time they annoyed their customers. Hence, the launch price for the disc-less version doesn't look very persuasive for consumers. Maybe, but keep in mind the MSRP of the Xbox One S is £299, so it's currently discounted by around 40% - I think pricing the disc-less version at 1/3 off the standard one is actually about right in the end. I fully expect to see slow intiial sales if retailers sell at the MSRP, and then steep discounts wtihin a few months where we'll start to see them coming in at around £130-£150, which is abit of a bargain imo. Selling for £99 or less just isn't realistic, so there is only so low they can go. Having just bought an open box one s 1tb from amazon for £133 I can see the appeal - game pass with its various offers (I got 9 months for £25 by stacking offers) mean a whole lot of gaming on the cheap. Gaming looks like it is increasingly going down the netflix route at the moment (either streaming or download like game pass). I was original against the idea but have slowly come to the realisation I rarely if ever play old games again and also rarely complete them so something like game pass will probably save me money… It does feel a little high priced though. I don't really see the point, you can have disc free gaming on normal versions of the Xbox One but at least you have the option if you do see a good deal on a disc or just want to use an old dvd/blu ray.